A girl runs through deserted farmland in Mynmar's Sagaing region where floods buried valuable fertile soil under several feet of mud which later dried hard and cracked, making land preparations very difficult and expensive. Increased hunger and food insecurity, fuelled by conflict and climatic challenges, continues to inflict suffering on populations in different parts of the world, forcing them to remain dependent on humanitarian assistance, a new United Nations report has warned. According to the Crop Prospects and Food Situation report, issued Monday by the UN Food and Agriculture Organization (FAO), the need for external food assistance in 37 countries – either affected by conflict or adverse climate shocks – remains unchanged compared to the situation three months back. 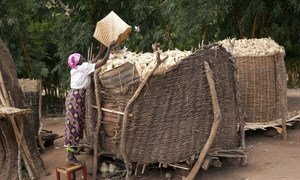 “Civil war and insecurity are direct reasons for high hunger rates in 16 of those countries, ranging from Burundi to Yemen,” said FAO in a news release announcing the findings. “Conflict is displacing millions of people, hampering agricultural activities and, in many cases, also driving basic food prices up sharply,” it added. At the same time, inadequate and erratic rainfall is also posing a growing threat to food security in southern and eastern Africa, where many rural households have suffered from four consecutive drought-affected agricultural seasons. In Somalia, aggregated cereal production for the country’s “deyr” rainy season is estimated at 20 per cent below average, and similar pattern in rainfall and yields has been observed in north-eastern Tanzania. Furthermore, prices of staple cereals such as wheat, millet or sorghum continued to remain high as a result of removal of subsidies, increased demand, and weakening of currencies. In the Democratic Republic of Congo, for instance, inflation pushed prices to more than double in 2017 to a 42 percent annual rate. Another factor driving up prices was the disruption of traditional trade routes due to violence, such as in and around the Sahel, as a result of which countries dependent on these routes (such as Libya) witnessed much higher prices as well as facing food shortages. The FAO report lists the following 37 countries as currently in need of external food assistance: Afghanistan; Burkina Faso; Burundi; Cameroon; Central African Republic; Chad; Congo; Democratic People’s Republic of Korea; Democratic Republic of the Congo; Djibouti; Eritrea; Ethiopia; Guinea; Haiti; Iraq; Kenya; Lesotho; Liberia; Libya; Madagascar; Malawi; Mali; Mauritania; Mozambique; Myanmar; Niger; Nigeria; Pakistan; Sierra Leone; Somalia; South Sudan; Sudan; Swaziland; Syria; Uganda; Yemen; and Zimbabwe.